Left to right: Jens Röttgering (owner and chairman of Hengst SE), Manfred Sauer-Kunze (MD, Delbag) and Christopher Heine (CEO, Hengst SE). 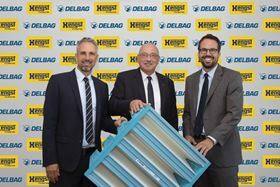 Hengst has acquired the German air filtration company Delbag from the FläktGroup. Founded in 1909 as Deutsche Luftfilter-Baugesellschaft, Delbag engineers, manufactures and markets air filters and air filtration systems for use in commercial, industrial and residential applications. Delbag is headquartered in Herne (Westphalia) and employs nearly 150 people in Germany, France, the Czech Republic, Poland, and Austria. In 2017, the company had sales of €30 million. Post-merger integration activities are already underway. Hengst Filtration enters into a binding agreement with FläktGroup to acquire German air filtration company Delbag. The Hengst Group appoints Dr Thomas Netsch as group vice president of Industrial Filtration. Hengst Filtration CFO Christopher Heine has been named CEO of the company.